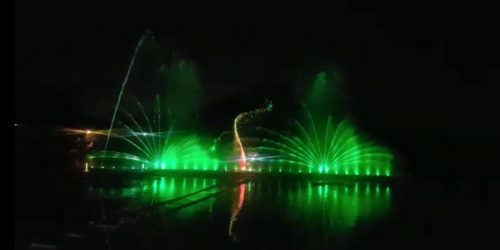 India Tourism Development Corporation Ltd. (ITDC) the public sector undertaking under the aegis of Ministry of Tourism, Govt of India executed the implementation of Multimedia show based on water screen projection at Tilyar Lake Rohtak, Haryana in collaboration with government of Haryana and Ministry of Tourism, Govt of India. The sound and light show has been created to project the rich and diverse history of the State of Haryana. The show was inaugurated by K J Alphons, Hon’ble Minister of Tourism, Govt. of India and Shri Ram Bilas Sharma, Minister of Tourism, Govt. of Haryana in Rohtak last evening. The total expenditure incurred on the project is around `5.4 crores and the project has been implemented by ITDC. The funds were jointly sanctioned by Ministry of Tourism and Haryana Tourism. The show has voiceover of Mr. Jitender Ram Prakash and Mr. Vijay Vardhan in Hindi whereas you will hear Kabir Bedi in the English version.